Prof Nutt says decriminalising cannabis could have health benefits. 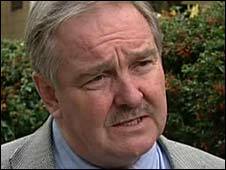 Sacked government drugs adviser Prof David Nutt has called for a Royal Commission to investigate whether cannabis should be decriminalised. Prof Nutt told the BBC the possibility of allowing Dutch-style cannabis cafes should be "explored". But his call comes as another academic is due to publish a study highlighting the possible links between the drug and schizophrenia. "The more you smoke, the higher the risk," Prof Robin Murray told the BBC. Prof Nutt told Radio 4's The Report that a Royal Commission on decriminalising the use of cannabis was a "sensible" idea and it could have "big health benefits." Why should people be imprisoned for possessing something that effectively will only harm themselves? He added: "We've seen some countries like Portugal make real progress in terms of drug-related crime and drug-related harms by decriminalising drugs of personal use. "You could make a moral position that why should people be imprisoned for possessing something that effectively will only harm themselves?" Prof Nutt said: "I certainly am interested in the idea that we might de-penalise possession and even allow the Dutch model for cannabis - the coffee shops - which could potentially have many benefits. "I think it's perfectly sensible to think about the Dutch model for cannabis and explore whether that might be a tenable way of allowing young people to get an intoxicant which is safer than alcohol, and which they could then use in a controlled, safe environment." He suggested that "trial towns" might be set up for an experiment. Prof Nutt was sacked three weeks ago from his post as head of The Advisory Council on the Misuse of Drugs (ACMD) by Home Secretary Alan Johnson, who accused him of campaigning against the government's decision to reclassify cannabis as a Class B drug. The professor had attacked what he called the "artificial" separation of alcohol and tobacco from illegal drugs and said smoking cannabis created only a "relatively small risk" of psychotic illness. But this view is challenged by research due to be published next month by Robin Murray, professor of psychiatry at the Institute of Psychiatry, who said that eight studies published since 2002 had shown that the risk of developing schizophrenia or psychotic symptoms was higher in those who used cannabis. He told The Report the risk increased in younger cannabis users and those who smoked skunk, the more potent strain of the drug. "Our evidence was that if you started smoking by the age of 18, then you're about one-and-a-half times more likely to go psychotic by the time you are 26," said Prof Murray. "If you start by 15, you're four and a half times more likely." He said that traditional studies showed that 8% to 15% of all schizophrenia cases could be attributed to cannabis but he added: "More recently, our evidence from south London is that it's more like 20% and I think that is associated with skunk." Prof Murray also said 20% of all the people who developed schizophrenia would not do so if people did not smoke cannabis, and in particular skunk. "I think that would be worthwhile," he added. Prof Nutt said Prof Murray's was an important study but "we need to know if it is replicated across the country". He added: "I'm not saying cannabis is safe, it is a dangerous drug, but the majority of people who use do not come to any serious harm." Prof Nutt said it was difficult to tell if the drug was more dangerous to adolescents. The Report is on BBC Radio 4 on Thursday, 19 November at 2000 GMT. You can also listen via the BBC iPlayer after broadcast or download the podcast.